So do you follow up with your customers? So many people do not follow up, and it is so frustrating for me as the potential customer. It kills me. When I leave a message on a voice mail or an answering machine and I do not get a reply, or when I fill in an email contact form and I do not get a reply – it really irritates me. A couple of weeks ago, we began starting a new fire alarm section on our fire protection website and I sent off ten email inquiries to people to get an initial thing completed. You might say why didn’t I ring them up? Well one I’m not in the UK right now, and two, really I want to see how keen they are and how organized they are and how much they want my business. So when I sent off those emails, how many do you think I got back? I got five. And the fifth one came in two weeks after it was sent out or about ten days after I sent it. That does not impress me at all. The others if they don’t want the business, just say sorry we don’t do it like that. One actually did reply to say that they only supply through a specific distributor network. That reply came back the following day, which was perfect. But why don’t people follow up? Apparently, according to statistics, the average is once or twice, if they follow up at all, but the vast majority don’t. Have you ever been to a trade exhibition, spoken to people, left your card and when you genuinely want to know more details and they haven’t got in touch? Now if you have gone after them and spoke to them, the normal answer is they laugh and say that they were overwhelmed with many inquiries, that they have not been able to get back to everyone. I don’t care. I am only interested in me, my inquiry with you. If I’m not important enough among the crowd or if you got too many, it doesn’t mean anything to me, it means you are awful and not organized, and you don’t care. Or perhaps the person I spoke to at the exhibition didn’t really want to be there, doesn’t care, and maybe threw his business card away. So here you go with five ideas with following up. This is not just about exhibition so hold on. First of all you know, grab a pen and a paper and write these down. 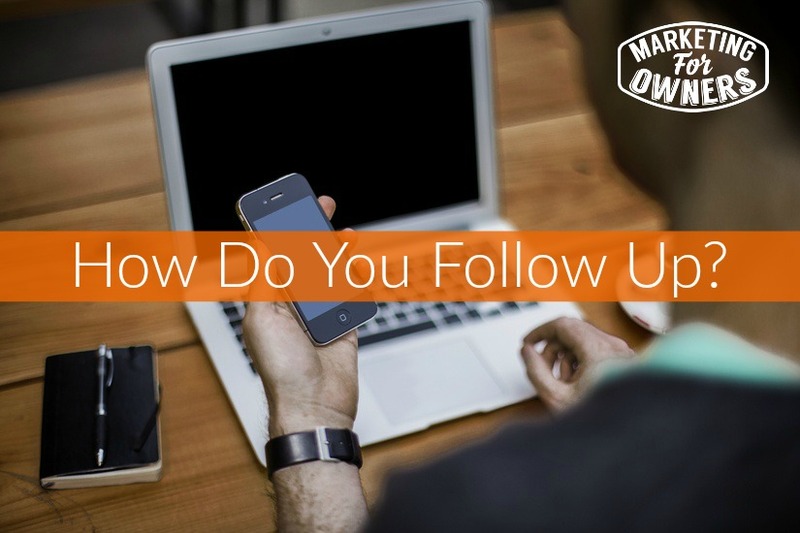 In your company you will get emails, so how do you follow up? So what I want you to consider, when you write these down is leave a little space in the second column, and write down email inquiries and then just jot down who, when, and how fast. Now you you might think, “Well I deal with my emails”, but what about your other staff who get emails. How fast are they answering? What is the company policy for answering those emails? What is the procedure set in place for answering? What happens when someone’s at lunch, or someone’s away, or when someone doesn’t turn up because they are sick for the day? It’s not planned. Who is handling their emails? Do they have an automatic message put on to say in reply, “Sorry I’m away and someone else will be handling my emails?? Do you have the time, what if they are overwhelmed, can they pass emails to someone else? Don’t think it’s just you. Remember not just you but have a policy so it’s uniform across the board, across the company. Its brand. On brand, on topic. Now again, put that in the first column. In the second column write who, when, and how fast. So if there is a telephone inquiry, now of course you may actually answer the phone but you may have to reply that person with some more information, do you do it right then? Do you stop everything and go do it right now and reply or do you have a time that you’ll say I will be back to you within. What is the procedure? Answering machine and voice mail messages, when are those dealt with? You come in the morning, if you use the answering machine or voice mail and you pick up messages, do you do those straight away before anything else? What’s the procedure? Who does them? Who checks the voice mail? Is it the same person? Do they know the procedure? How fast do you reply? Who replies? What sort of reply? What happens if the person they want to speak to, they’ve left a message for somebody, that person isn’t in? Do you just ignore that and think they’ll be back in a couple of days? If you’ve got reps, or engineers or service engineers or something like that who are out and about who use mobiles or cell phones, what about their voicemail? Is their voice mail on message or do they have some ridiculous recorded message? Is it company-ish? Is it on brand? How soon do they follow up, and how do they follow up? Do they just do it while they are driving along in traffic while shouting from the speakerphone and they’ve got their music on in the car? Think about it, and think how they follow up their calls. An invoice is following up. If you do a job for somebody, you need to charge them. I can’t think of the number of times when small businesses do jobs for us and we have to chase them to send them an invoice. Now I don’t know if the small business is thinking to itself what do they care, they are not paying, we are prepared to pay you, we want to pay you, we want to help you, you helped us, we want to pay you. If you don’t send us a bill, you are not helping because you are not giving us the invoice that we can apply to the cost of the job. If your invoice is a month later, it’s in the wrong month, it doesn’t help us. If you wait till the end of the month and think I’ll do it all at the end of the month, why? The people are going to take thirty or sixty days to pay, why are you not invoicing on the same week? Who does it, when do you do it, how regularly? You don’t have to invoice every day. Pick one day a week, a specific time between ten and eleven on a Thursday morning for example, that’s when invoices get done. So that’s a type of follow up. Why wait? It’s your money. If you are accepting business cards from people, what are you doing with them? Are you scanning them, are you writing them down, are you putting them in a bucket? 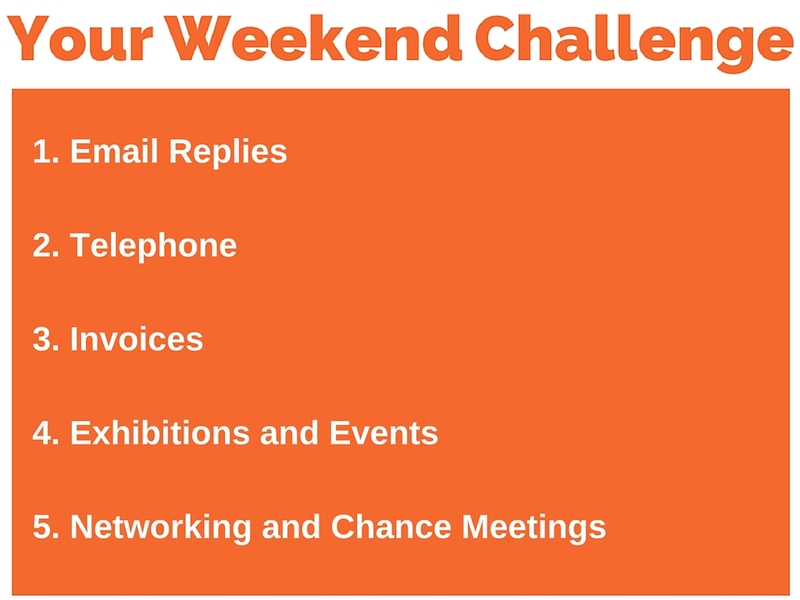 Who is going to follow up, who is going to enter those into a spreadsheet, (yes a spreadsheet, because you want a list of people who attended that exhibition so that when you come up with the next exhibition, you can invite those people to come and visit your stand). 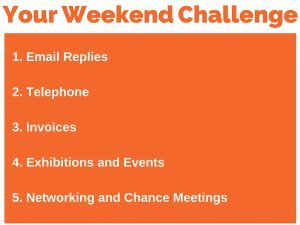 You know they go to exhibitions and because you would have followed them up if they got a card even if you didn’t jot on the back of that card what they inquired about, and now you can follow up with them through the phone, and email, or write them a letter. How are you actually following up, and who is following up? The person who is actually at the exhibition might be very busy. They might be taking a week off because they are at an exhibition. Are you thinking they are doing it? Are you assuming they are doing it? Have you got a procedure? Another thing to consider by the way, obviously an email list, things like Aweber, Mailchimp, Convertkit, these kind of things. Mailchimp has got one of these, we don’t use it because we use exhibitions, but mailchimp has a subscribe and you can have an iPhone. They can actually subscribe into the email by using their phone while you are offline and later when you get back on line you can hit upload and it uploads it into your list. If you or your staff go to a networking event or a chance meeting with somebody, take a contact detail. Are you thinking that person that is your staff is going to get back to them? What if that person is busy? They didn’t get any commission, and there’s no interest, it’s just another job for them. Do you have a procedure, and who does it, who follows up, and how soon do they follow up, and when do they follow up? So I just want you to think about following up. Those are people that have come to you that have offered their detail to you in some form and it doesn’t matter who they are, be sure and follow up. These are potential customers, and they could be suppliers, so whoever it is they are people who like you, continue to have them like you by following up. Don’t join the frustration list. So that’s your weekend challenge, I want you to think of these things, and try to systematize, and make it all equal through the company. Make sure everyone is on brand and on topic with the message and that’s it. Otherwise have yourself a super weekend and I’ll have something good for you on Monday. Which of these are you missing out on?